Twelve-year-old Lonnie is finally feeling at home with his foster family. But because he's living apart from his little sister, Lili, he decides it's his job to be the �rememberer��and write down everything that happens while they're growing up. Lonnie's musings are bittersweet; he's happy that he and Lili have new families, but though his new family brings him joy, it also brings new worries. With a foster brother in the army, concepts like Peace have new meaning for Lonnie. Told through letters from Lonnie to Lili, this thought-provoking companion to Jacqueline Woodson's National Book Award finalist Locomotion tackles important issues in captivating, lyrical language. Lonnie's reflections on family, loss, love and peace will strike a note with readers of all ages. Peace, Locomotion by Jacqueline Woodson is an epistolatory novel, meaning it’s written in letter form, told through the letters of twelve year old Lonnie Collins Motion to his sister Lili. Basically, Lonnie and his sister are in foster care, but with two different families, and Lonnie feels he must write a letter to his sister every day they are in foster care so they can remember the stage in their life, he doesn’t send the letters though, choosing to save them for when they get out of foster care. Peace, Locomotion by Jacqueline Woodson is a beautifully written novel, often poignant and honest as we view Lonnie’s coming of age through his own eyes. I believe the book is set in current-day. The letters don’t have a date on them, but there is much mention of war and peace. Peace, Locomotion mentions how there hasn’t been a draft yet, but states how it could occur. Overall, though Lonnie firmly wishes for peace and happiness, which echo throughout most of his letters. I guess, I felt a sort of serenity while reading Peace, Locomotion, as Lonnie’s voice is a very calm voice, perhaps a bit wise for his 12 years. If you do decide to pick up Peace, Locomotion by Jacqueline Woodson you will probably finish it in one day. The letters are easy to read, the pacing is quick. Also, it’s 136 pages with somewhat large type. I know I just zoomed through this. Also, there is a book which comes before Peace, Locomotion, simply called Locomotion. 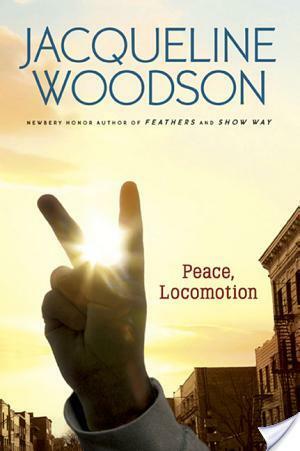 I have not read it, and I didn’t feel lost at all while reading Peace, Locomotion by Jacqueline Woodson Obviously reading the previous book will only enhance your reading experience, but in this case Peace, Locomotion�is a good read regardless of whether you read Locomotion or not. I love epistolatory novels if they're done right. It sounds like this one was. I love the quotes you've chosen! Okay, other than the fact that it's Woodson: epistolary! I want it RIGHT NOW. This looks great. I'll have to check it out – I have read one of her other books, and I loved it. After reading If you come Softly I am convinced that Woodson is brilliant! This one sounds good too! This sounds like a really great book. Glad you enjoyed it. I'll looking into picking this or Locamotion up. The characters sounds really endearing. Whew — sounds like a tearjerker. Even the quotes you pulled got the water-works going. Great review… I think I'd enjoy this one. This sounds so good. I just read Locomotion (and would definitely recommend it) and I really like the idea of following the story in this one even though the format is different. Great quotes there too. You're our POC Challenge winner for April. Love what you do and so glad you're a member at Color Online.